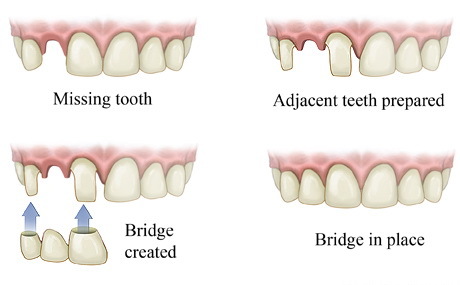 Bridges are elongated crowns that span over a missing space in the mouth. They are false teeth that are designed to “bridge” the gap created by one or more missing teeth. Bridges are anchored on either side by crowns and cemented permanently into place. A bridge does not come in and out of the mouth; it is permanently cemented into place. This is an alternate plan to an implant or dentures.